After a long wait and even longer appeal process, you finally received a decision from the Board of Veterans Appeals (Board) and you have been denied veterans disability benefits. This denial can be incredibly disappointing, but you still have options. For some veterans, appealing their decision to the U.S. Court of Appeals for Veterans Claims (CAVC) is the right choice. The CAVC was established in 1988 to review any decision issued by the Board. The CAVC is completely separate from the U.S. Department of Veterans Affairs (VA) and is actually a part of the federal court system. The judges in this court have the ability to reverse the Board’s decision; uphold the Board’s decision; or remand the case (send it back to the Board) for a new decision, further development or correct the VA’s failures in procedure in determining your case. Keep in mind that the CAVC cannot review new evidence; the Court is only reviewing your case to determine if the VA followed all of the appropriate laws, regulations and guidelines when making your decision. This means that they cannot accept updated medical records or information about new impairments or problems. Should I Use a VSO or Attorney to Help Me with My Appeal? 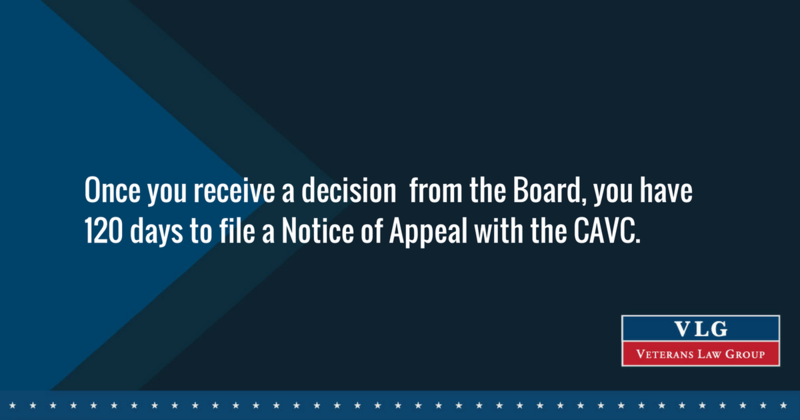 If you are appealing to the CAVC, it is not mandatory that you have an attorney or representative. Technically, you have every right to carry out the appeal yourself. However, keep in mind that there will be an experienced attorney on the other side of the case who does this type of work every day, and who will be making legal arguments against your appeal. A lack of representation or support in a CAVC appeal could put you at a real disadvantage, primarily because most people are not accustomed to writing legal briefs or making legal arguments. If you do decide to represent yourself, the judge will hold you to the same standards as an accredited representative or attorney, which can be overwhelming for many people. When selecting an attorney or representative to assist you with a CAVC appeal, make sure that they are accredited to handle this type of appeal. The court will not appoint an attorney for you, so you will need to research the representatives in your area and find one that you trust and that you believe will act in your best interest. The CAVC provides a list of attorneys/representatives that are accredited to handle appeals here. Many attorneys/representatives will handle payment for this type of case on a contingent basis (only if they win) or will not charge a fee. Even if you decide not to hire an attorney/representative, you should contact your veteran service officer (VSO) as soon as you receive your denial from the BVA. The VSO can review the decision with you, answer your questions, and help you make the strongest case for your benefits. Finding answers to your disability claims questions doesn’t have to be difficult. Take our free quiz to determine what resources are available for your specific needs.